It had been months, but the email I was waiting for finally came in. “I think it’s going to work out … Will confirm Monday,” was all it said, but I jumped to my feet. Hello Ocean, our research foundation, was about to launch Expedition Underway, its very first research-under-sail expedition. Thanks to a partnership with the charter company The Moorings, we were headed to Belize for some pioneering ocean research. 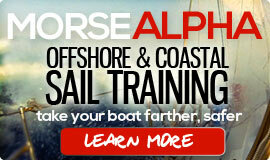 I’ve been a sailor, both professionally and recreationally, for two decades. Sailing provides me with an opportunity to escape, to explore and to experience new environments. Places where I can witness amazing examples of nature, like leaping dolphins, colorful coral reefs or thunder holes on a rocky coast. Recently, however, I find myself wanting more—to give back and ensure that future sailors have the same opportunities I have. This was the inspiration behind Hello Ocean, a foundation that strives to expand ocean conservation and research through citizen science and educational media. Nataly and Benito picked us up in Belize City and we drove south to Placencia, where we checked in at The Moorings base there and moved aboard the Moorings 4800 (Leopard 48) that would serve as our research platform. The catamaran turned out to be ideal for our work. It was comfortable and spacious enough for all eight of our planned crew to live aboard, and it had several large gathering areas where the entire crew could conduct meetings. Better still, the dolphins loved to “bow ride” the waves created by the bow of each hull. Bow riding is similar to body surfing, and the dolphins do it for the same reason humans do—because it’s fun! Dolphins can be pushed along in the pressure wave without requiring many tail beats. They’ll even compete for the best positioning in the wave. By noon, our entire team had arrived. 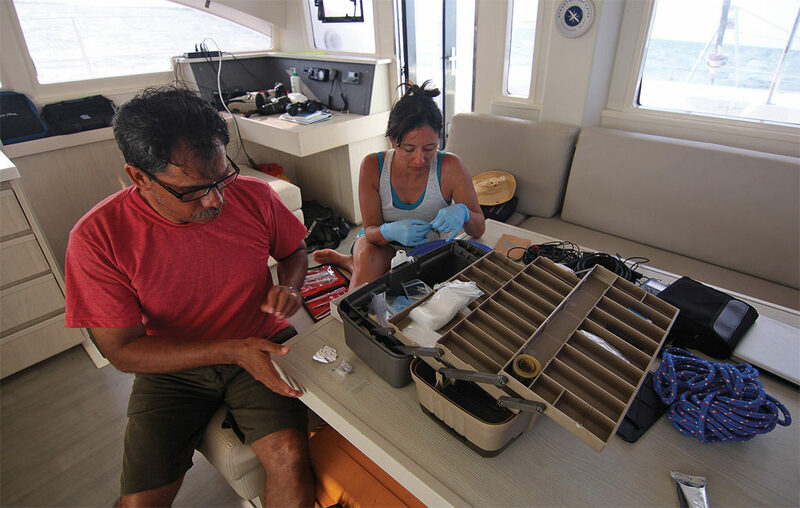 In addition to Nataly and Benito, scientist Eric Ramos and his two research assistants, Kristi Collom and Alton Jeffords came aboard, bringing with them four huge waterproof boxes full of hydrophones recording underwater dolphin vocalizations, along with drones for aerial surveys and observations. 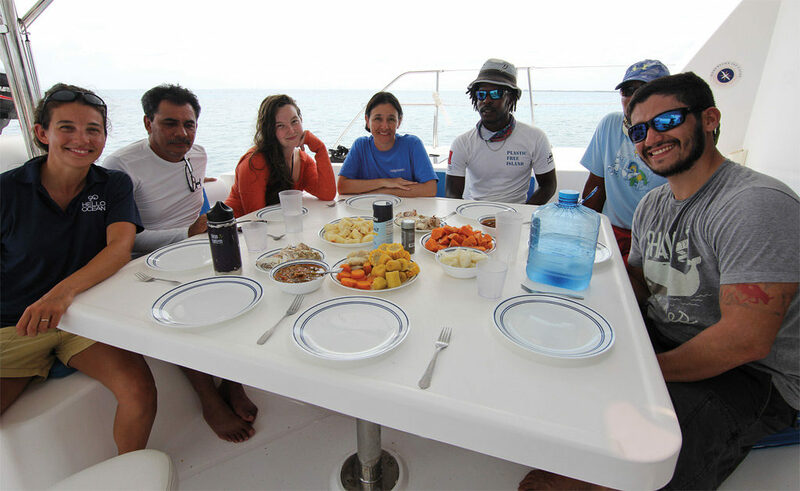 We didn’t want to stop for lunch, explore the amazing islands of Belize, or snorkel the best reefs. We were on a mission. Also aboard was our skipper, Jeremy, a seasoned Belizean sailor. With countless Moorings charters under his belt, he claimed he could “sail anywhere,” and we certainly benefited from his knowledge of the area. “This is the strangest charter I have ever done,” Jeremy said, referring to our daily morning meetings, our dinner conversations of scientific jargon, and rigorous hours spent staring at the horizon just looking for dolphins and floating trash. 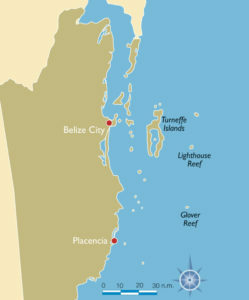 We didn’t want to stop for lunch, explore the amazing islands of Belize, or snorkel the best reefs. We were on a mission. The Mesoamerican Reef system is the second largest in the world and contains the largest barrier reef in the Western Hemisphere, stretching nearly 700 miles from the northern tip of the Yucatan Peninsula down through the Honduran Bay Islands. It also provides hundreds of miles of protected sailing by breaking the swell caused by the persistent tradewinds outside. There are hundreds of islands, most of them empty and small with few restaurants, no megayachts and very few supplies. Once you leave the mainland, you are “out there.” Despite the beautiful anchorages, good winds, calm seas, it’s not easy cruising. There are so many corals and shallows that navigation charts simplify by saying “numerous coral heads.” Local regulations don’t allow you to bareboat charter outside the barrier reef, but with Jeremy aboard we were able to sail the deep waters to conduct these groundbreaking studies. Offshore, there are three atolls—Glovers, Lighthouse and Turneffe—and we conducted our research transects in between them. Each atoll is a day sail away from the other, and all three provide their own adventure in which you could spend weeks exploring, diving and fishing. 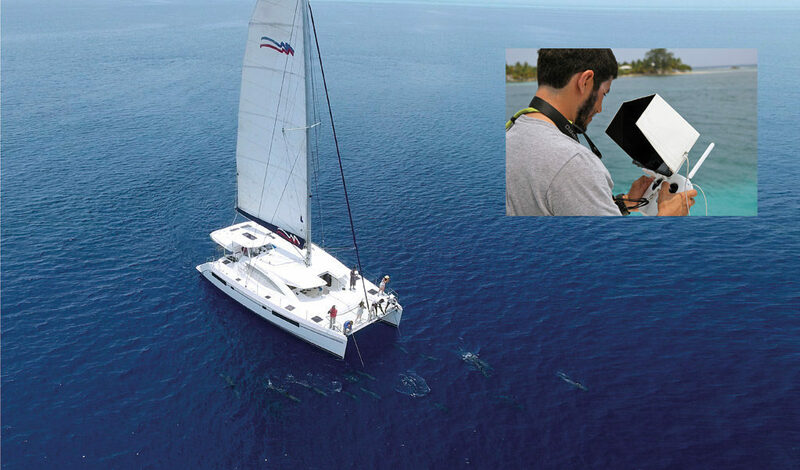 Sailors in Belize often have encounters with dolphins. But if you had asked a scientist how many dolphins live there and what kind they are, the answer would be, “We don’t know.” It is hard to believe, but up until our survey, there had been no systematic study on population data of cetaceans in the offshore waters of Belize. Hello Ocean changed that by helping organize Expedition Underway. 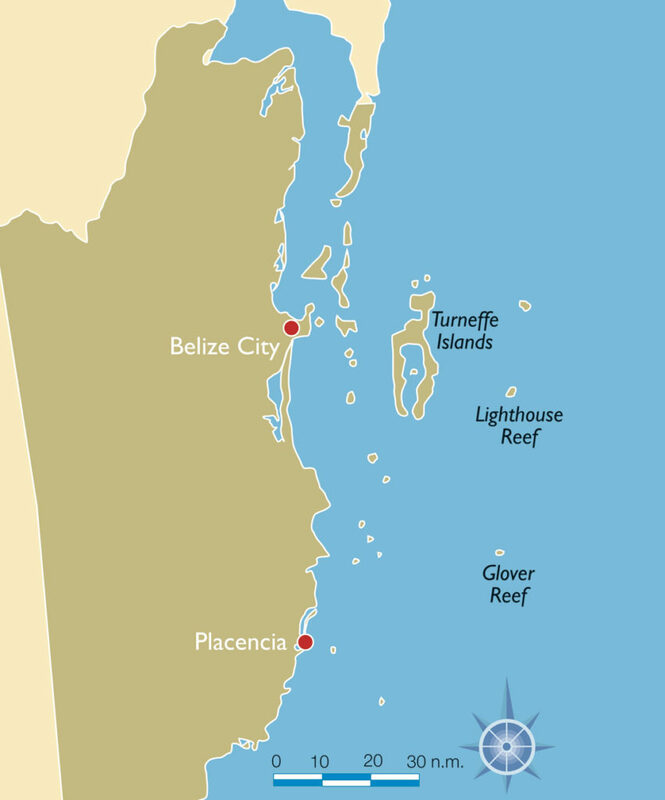 During those seven days we helped Eric Ramos conduct the first systematic study of cetaceans in the coastal and offshore waters of Belize, and also collect data to support an ongoing study by 5Gyres, an organization working to combat the high levels of marine debris in the world’s oceans. Our first full day of study began at 0700, although most of the crew had already been up for several hours, prepping equipment or reviewing procedures in anticipation of the long day ahead. Scientific study is conducted according to a specified structure, using exacting methods. The entire crew, including the skipper, needed to know the procedures to ensure the most accurate study possible, so each day began with a morning meeting to ensure a cohesive and focused effort. The observation methods required four lookouts positioned at each corner of the boat. We each had our favorite spot but rotated every two hours to reduce fatigue, help prepare meals and provide a break from the intense sun. We motored or sailed from 0800 until 1700 every day, and always had each of the four positions manned. The goal of our survey was to identify and count all the debris and marine mammals that we could see along a specific transect. By noon the first day I had already logged 49 pieces of trash floating in the water. I saw plastic bags, bottles, food wrappers, buckets, cups and plenty of tiny pieces less than an inch long. Plastic debris is currently one of the top research interests among ocean scientists. Unlike paper, aluminum or glass, plastic degrades every time it is recycled, producing a “new” material of lesser quality. As a result, eventually, all plastic material becomes trash. According to a study by 5Gyres, we currently recover only about five percent of the plastic we produce, while half of it goes into landfills and the remainder is “unaccounted for.” The latter was what I was seeing floating by at intervals of no more than nine minutes. Worse still, it isn’t just floating there benignly. Plastic leaches toxins continuously and are often mistakenly ingested as food, harming or killing organisms, and contaminating our own food supply. Instead of allowing this to bring me down, though, I chose to focus on the opportunity this trip was affording me. As an individual, it’s difficult to believe that I can make a real difference in ocean conservation. But in truth, I can. I tackle one small challenge at a time and get creative—having fun with each mission. It began a few years ago when someone challenged my husband and me to a New Years resolution to stop purchasing all beverages in plastic containers. As a result, we drank a lot of tap water and wine and were much healthier because of it. It was tough on road trips where bottled water was no longer an option. But we quickly adjusted and have been doing this now for several years. Each year we try a new challenge from “no snacks in plastic packaging” to “purchasing no disposable plastic altogether.” We succeed, we fail, but mostly we learn how to make more informed choices. Just when I was beginning to think we wouldn’t see any cetaceans at all, I heard the call. “Dolphins at three o’clock!” came the shout from the bow. In an outbreak of excitement, everyone grabbed their equipment and ran forward. Benito positioned himself on the port bow with a biopsy tip fixed to the end of a 15ft pole. The biopsy tip is a hollow cylinder with a tiny blade designed to scratch the skin of the dolphin, and collect a small skin and tissue sample. Alton also readied himself on the starboard bow with a crossbow and modified arrows, also with a biopsy tips, for use with larger animals. Meanwhile Nataly, Eric and Kristi were preparing to snap pictures for photo identification purposes while Ben and I were covering video. Jeremy’s job was the most important—stay with the dolphins as long as possible. The excitement was high as the pod closed in on us, leaping and playing in the bow wave, diving under the boat, swimming away and then coming back. “Ten o’clock, surfacing,” Eric shouted, and we all ran over to the port side, snapping pictures as fast as we could. Instead of tagging or other invasive methods of identifying individuals, our team took hundreds of photos of dorsal fins, a method called “photo identification.” The dorsal fin of each dolphin has markings on it, notches, scratches or nicks, that create a unique pattern, much like a fingerprint. The photos are then cataloged so that by identifying individual dolphins, other scientists can begin to not only determine populations but study their range and behavior. It can be time-consuming to sift through the catalog of photos, and there are programs that digitally analyze them. However, in Belize, so few studies have been conducted that the database is still small enough to manually sift through. “Port bow, surfacing,” someone shouted, and Benito readied his biopsy pole. Then when a dolphin was within inches of the surface, he thrust the pole downward in an attempt to tap its back. During that first day, it took several attempts to successfully collect a single sample. But by the end of the expedition, Benito was a pro, scratching their backs just right to collect a good sample without even causing them to flinch. “It will help us determine if these individuals here in Belize are at more risk than other populations and be able to advocate for their protection in an area that doesn’t have it yet,” added Eric. By the end of the first day, we had two sightings—a solitary manatee, and a pod of five dolphins. We collected one skin and tissue sample, conducted seven hours of surveying and logged 54 pieces of marine debris. Not bad for the first day. Each day after that our numbers steadily improved. One day, when a pod of dolphins had stayed with us for several hours, Eric and Kristi pulled out the hydrophones. After that Jeremy brought the boat to a complete stop, creating a surreal moment, as we sat quietly on the cat’s aft deck in the glassy calm. The dolphins had spent the past few hours bow-riding, leaping and swimming along with us. But now they were tired and swimming lazily alongside. Kristi sat on the swim deck and dipped the hydrophone in the water, holding it steady between her feet. As anyone who has ever watched an episode of “Flipper” can tell you, dolphins make sounds for communication and echolocation, a method for locating objects by producing a short blast of sound. It is similar in function to the depth sounder of a boat, yet far more advanced than even the best human-made technology, and dolphins use it to gather a wide variety of information about their environment. Underwater there was a cacophony of clicks and whistles. Long siren sounds, rapid machine-gun clicking and slow popcorn pops. I wonder what they were saying. Field research and marine science isn’t everything we imagine it to be. No one wore lab coats or pulled up databases locating dolphins. 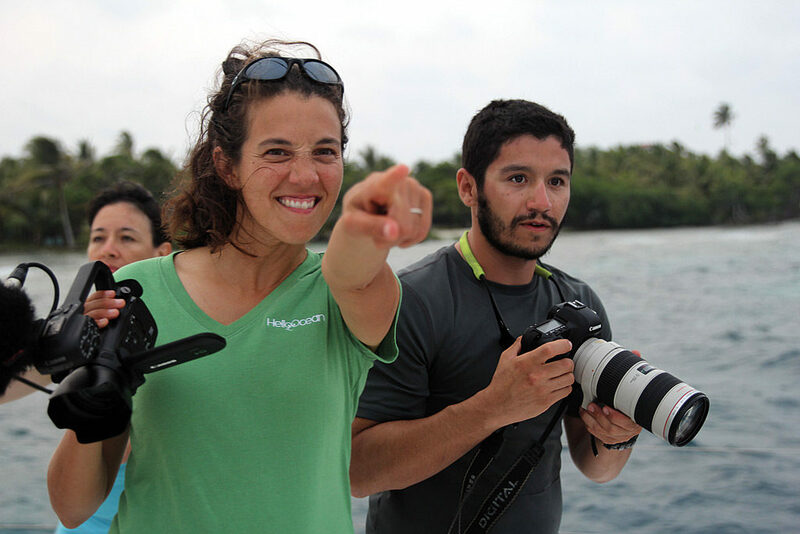 Even though Eric and Nataly are dolphin researchers they still found joy in each glimpse. And even though Kristi is an ocean science educator, this was her first encounter with a dolphin in the wild. So, why must we count these animals? Isn’t the magic of seeing them enough? Well, to effectively manage and protect cetacean populations, we need to know things like animal abundance, their range and how these phenomenon change over time. To do that, it starts as all scientific inquiry does, by sitting silently and just taking a longer look. 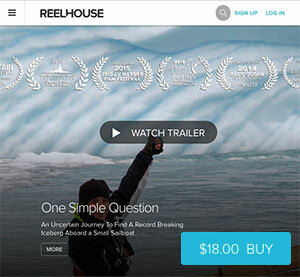 To see the video of the research expedition or find out how you can join future expeditions, visit helloocean.org. Hello Ocean’s conservation and research projects are made possible through public support. Thanks, in particular, to The Moorings for its help. What a neat undertaking — so valuable! 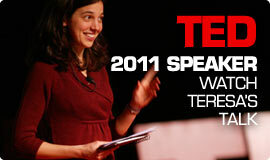 Thanks for sharing; looking forward to more! Great work – keep it up! Thanks for sharing.